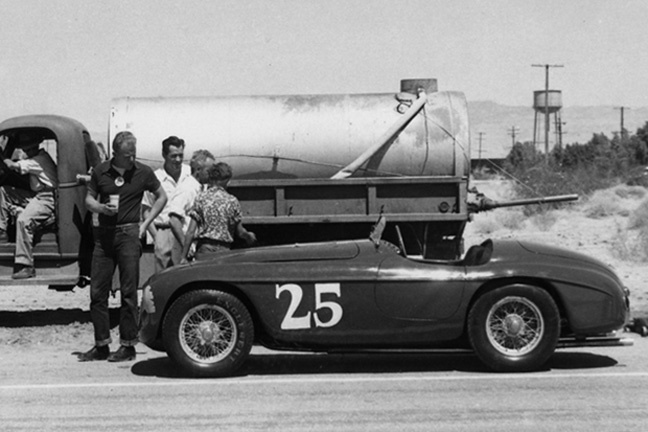 Jim Kimberly’s Ferrari 166MM Touring Barchetta at Palm Springs, April 1951. Photo William Edgar. One of my more recent Ferrari articles for Forza magazine is in the June 2013 issue. It’s an “I was there” story of the very first Ferrari to be seen in West Coast sports car racing competition when this James Kimberly-entered chassis number 0010M won the 2nd Annual Palm Springs Road Races main event on April 1, 1951, masterfully driven by Marshall Lewis. “Gentleman Jim” Kimberly was to drive the car, but he was called back to Chicago just before the race, allowing his mechanic and sometimes co-pilot Lewis to show Westcoasters what a 2-liter Ferrari driven in anger would do to the competition–smaller, equal, and larger displacements–by winning the 65-lap contest two laps ahead of the rest of the 31-car field after a scorching 2 hours and 42 minutes on the southern California desert airport circuit. No ordinary Ferrari–if ever there should be such a thing!–this ex-factory-raced 0010M had finished second overall in the 1949 Mille Miglia before winning that year’s 24-hour Grand Prix of Belgium at Spa-Francorchamps, there under co-drivers Luigi Chinetti, Sr. and Jean Lucas. The historic car is currently owned by Jon Shirley of Medina, Washington, who has co-driven it several times with his sons in the Mille Miglia Storica as well as shown, rallied and vintage raced it. My sidebar, Jim Kimberly’s Racing Years, offers a final page biographical sketch of the life of “Gentleman Jim” during an era when personal style ruled above all. For more on my recent, current, and upcoming articles, please click on this website’s “Articles” page and scroll down past the Ferrari GTO interior and steering wheel photo. This entry was posted in Uncategorized and tagged Ferrari 166, James Kimberly, Jim Kimberly, Marshall Lewis, Palm Springs Road Races. Bookmark the permalink.